Maravilla Resort Community in Destin, Florida is a gated community that offers a beautiful large private beach, tennis courts, two swimming pools, club house facilities, barbecue grills and a fitness center. 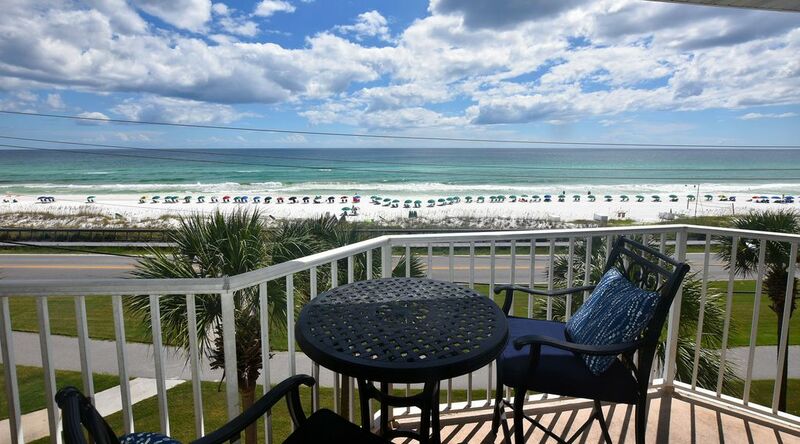 The resort's private beach is 2.5 acres of sugar white sand along the beautiful Emerald Coast of the Gulf of Mexico in Destin Florida. Beach service for umbrellas and chairs is included with all rentals. There is a volley ball court set up at the beach for the enjoyment of owners and guests. The beach service also rents kayaks and boogie boards. The gulf front pool is a favorite of Maravilla visitors. The club house pool and the hot tub are heated during cooler weather. All of Beach Condos in Destin’s Maravilla rentals are pet friendly and have wireless high speed internet as a free service. The beautiful beach with beach service, upscale gulf front condo which is pet friendly, great community with biking/walking paths with a view of the gulf all make this condo unique and a joy to visit. Clean & pretty with a beautiful view! The condo was very clean and well decorated. Enjoyed our time there very much. The master bed was very comfortable. The only thing that was less desirable was where you had to take your trash to. It was really far away from most of the condos. Most people would drive their trash to the dumpsters. This is not controlled by the condo owners but is a feature of the condo community iitself. Could not ask for a better place to stay! Furniture comfortable, clean, everything you need to enjoy the beach. Love that the umbrella and chairs are included and Matt has paddle boards and kayaks to rent at really reasonable rates. We will definitely rebook here! The only down was the cleaning crew was rude in passing and they walked in without knocking at 9am. Very nice. Beautiful views, nice having washer and dryer in unit. Convenient to beach. Great beach service. Might need little things(salt, pepper, garbage bags, paper towels, toilet paper, etc.). Overall, a very nice place to stay. We love this condo but you need to invest in some new cookware. The skillet is burnt up and hard to cook breakfast in. The coffee maker is rusted out. Thank you for letting us know about the needed cookware and coffee maker. We will replace those items. We are glad that you enjoyed your stay. Loved Maravilla! The grounds are well maintained and pet friendly. The condo was clean and comfortable. Our yellow Lab thoroughly enjoyed his space. Other dog Owners were courteous as well. We can’t wait to come back!